I walked into the laundry room to check on her laundry because I wanted to use the washer. Something didn't look right. I opened to door to find this. 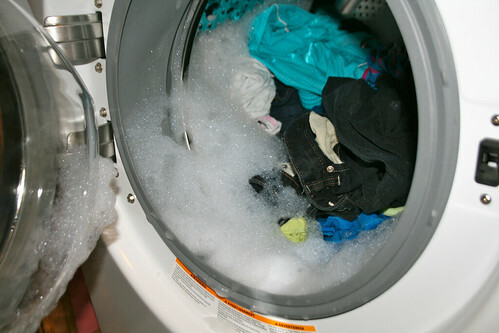 I think she used a little too much detergent. I asked her about it and she confirmed that she used a lot. So I set the machine to do a rinse and spin to clear up the extra suds. Then I noticed a funny symbol lit up on the display. The machine had gotten off balance because she had done such a small load. It couldn't finish the cycle, hence the suds. So I guess it wasn't Meg's fault after all but she was retrained about not using a lot of detergent. The one big complaint I have about the front loading washers is that you can't do a small load without upsetting the machine. Otherwise I love it.